In the past few months, many a Londoner will have enjoyed the exhibition on The Lost Library of John Dee (1527-1609) at the Royal College of Physicians, London. The show is now over, but it has been a stimulating, refreshing one, and a brilliant idea to bring together some of the recovered books of the great Elizabethan scholar and the artefacts that best define his ambivalence around magic and angelic communication. Those books do have a story. A genuine polymath, Dee was also a prominent man at Elizabeth’s court and advised the Queen on health matters, even though he wasn’t really a fully trained physician. Some say that he was also her spy on his multiple trips to the continent. But he had his dark side, and his practise of magic got him arrested at some point. The RCP smartly drew on their own valuable collection of medical books, which includes dozens of Dee’s own. They are the faint tip of an iceberg. Dee was a collector of books: he accumulated several thousand books, including a thousand manuscripts, from his student’s years to the height of his career. In the quiet of his house in Mortlake, west of London, he installed a purpose-built library to house his collections, as well as several labs for his experiments. But fate played tricks on the scholar. As explained in the exhibition, Dee’s once remarkable library was dismantled and sold in an act of treachery: his brother-in-law took advantage of his departure on a long trip to get rid of the books, which were scattered around, and Dee, to his great dismay, could never recover them. The fragility of books is a recurring tale throughout history: in late 2nd -c. Rome, a fire robbed Galen (129-c.216) of his most treasured possessions, notably his books. The Pergamene embarked on a complex adventure of recovering dispersed copies of his own works among his friends, and of re-writing what was irremediably lost. This took him many years. Dee, upon departing to Europe, trusted his close family with his books, and was made to pay for his candour: his books were taken away from him by greedy pupils, friends, relatives, with little hope of tracing them back. Hence the pleasure to see a selection of his once beloved books together in a public space. The exhibition also brings to light the duplicity of some of Dee’s close friends or relatives, who erased or disguised his signature in order to appose theirs on the stolen copies. One such treacherous act is pictured on one of the illustrations above. Paradoxically, their misguided efforts sometimes helped modern librarians reconstruct the remains of Dee’s library. Dee’s interests were boundless, and the few recovered books from his collection reflect his all-embracing mind. In the exhibition, books of Latin poetry and history, rhetoric, science (esp. Euclid’s Elements), natural history and philosophy, magic and astrology were exposed, to an impressive effect. Most bear annotations in his own hand. Dee didn’t just gather books, he actually engaged with their contents. What startled me, however, was the absence of any Galen book. 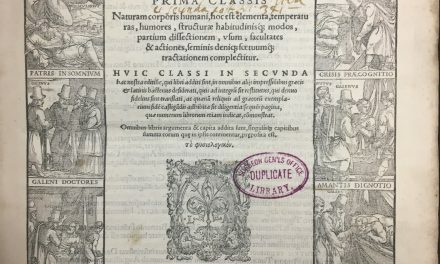 How come such a scholar, famously versed in medicine, could not own any Galenic work – or rather, how come none of them has resurfaced in libraries through the years? 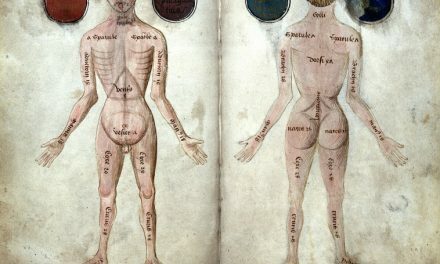 Surely, there must be quite a few, but not in the RCP library (a catalogue of their Dee books is available to download from: https://www.rcplondon.ac.uk/news/lost-library-john-dee). But some surprises may arise. Just across the road, a few hundred yards down Euston Road, in the Wellcome Library, at least one of Dee’s copies of Galen survives. As I was rummaging through the available Renaissance translations of Galen a couple of years ago, looking for evidence for my new project, I stumbled onto a very small book once owned by John Dee (picture above). I didn’t make much of it: the signature didn’t seem particularly significant to me at the time. After all, I never was into John Dee in particular and didn’t know about the story of his dispersed library. But – thanks to this exhibition! – I now see that book as an interesting testimony of Dee’s interests, and of Galen’s reception in the 16th c. So what is this book about? Well, the book is a 1550 copy of Johannes Struthius’ translation of the Galenic Prognostica de decubitu infirmorum ex mathematica scientia. A date has been added: 3 August 1551. Struthius is an interesting, though little studied, Polish scholar of the mid-16th c. He translated a few Galenic works, mostly to do with the art of prognostication. The Prognostica ascribed to Galen are, however, a curious choice, for it is an astrology work, not so much a medical one. Perhaps it could be called an astro-medical work. It was quite popular in the middle ages, in various guises and languages. In any case, it is not an authentic work by Galen; rather, it slipped through the authentic body of works by Galen through a series of accidents. The commentaries accompanying the original text in the printed book, as well as Dee’s annotations, reflect the growing suspicion against authenticity. Yet, Dee was clearly interested in the contents of this pseudo-Galenic work, as demonstrated by additional annotations of his. As far as Galen is concerned, it is clear that the corpus was still extremely fluid, and texts were constantly being added or removed (but mainly added!) to his known “complete works”. But to a scholar like John Dee, as to many other scholars from this time, authenticity wasn’t a prominent concern. Rather, the usefulness and intrinsic interest of a book made it valuable. In many ways, early modern scholars were more open-minded than our contemporaries.